PARIS (AFP) -- The U.N. cultural agency said Wednesday that the ancient Syrian city of Palmyra had suffered significant damage at the hands of Islamic State fighters, but that the archaeological site retains much of its authenticity. UNESCO sent experts to the world heritage site to study damage caused by the Islamic State group which held the city for nearly a year before it was retaken by President Bashar al-Assad’s forces last month. Escorted by U.N. security, the mission inspected both the Palmyra museum and the archaeological site. “They took stock of considerable damage to the museum where they found that most of those statues and sarcophagi that were too large to be removed for safekeeping were defaced, smashed, their heads severed, their fragments left lying on the ground,” UNESCO said in a statement. At the archeological site, the experts noted that parts of the grand colonnade -- an ancient avenue -- and agora courtyard were intact. “They observed the destruction of the triumphal arch and Temple of Baal Shamin, which was smashed to smithereens,” said the statement. The experts observed a minute of silence in memory of victims murdered by IS at the Roman Amphitheatre - which was used for public executions by the jihadists. According to the statement some sites had to be observed from a distance where demining operations had not been completed. UNESCO will deliver its full report on the site at the world heritage committee’s annual meeting in July in Turkey, and will send another mission to examine Syrian heritage sites in greater detail. Palmyra, north-east of Damascus, contains the monumental ruins of a great city that was once a crucial hub for trade and culture. 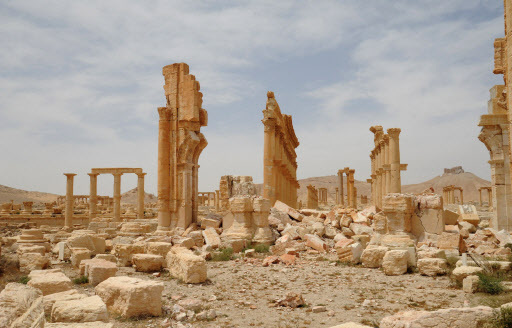 Until the Syrian conflict broke out in March 2011, Palmyra was a key tourist destination.